Writing about beauty products is something that I find relaxing. Is that weird?? I don’t know, but it’s definitely less stressful than writing, say, a speech. Plus, I haven’t done anything on beauty in a while now (related: my review of the ordinary skincare and this heavenly-smelling body polish I love). I had the opportunity to try Biore’s Blue Agave Infused Collection recently, and they kinda blew me away. That doesn’t happen often, so I knew I had to write about them! Both of these masks, which launched this year, are suitable for combination skin types. The one I was most intrigued by was the Blue Agave Instant Warming Clay Mask ($9.99 at most drugstores near you). It reportedly has a “self-heating technology”, and I was curious to find out what exactly that meant. Also, it claims to give pores a deep clean and help your skin feel refreshed after. So I put it to the test without hesitation (see selfie below). Having had lots of dry patches on my skin recently - dang you, winter - I thought it would be interesting to see how this mask would affect my skin. I was a tad worried that it would act too strongly and cause a reaction or, worse, a breakout. Also, smearing Smurf blue goop on your face would give anyone pause - I mean, don’t I look like a character from Avatar or something? Anyhow, the Instant Warming Clay Mask is made up of four individual sachets. I like how travel-friendly they are, and also that the amount of product in each sachet is pretty generous. But the highlight for me was the warming sensation I felt immediately while massaging it into damp skin. It was heavenly! My only tiny word of warning is to dab a pinky-sized amount on your forehead for a start so you don’t get a shock at how warm it feels. I slathered on a thumb-sized amount on my first go, and it felt way too hot for my skin at first. Still, the more I applied it onto skin with gentle massaging motions, the more I got used to the level of heat the mask produces. The clincher for me, though, was how effective it was. After leaving it on for five minutes and then washing it off, my complexion felt instantly smoother and softer and looked much clearer. My skin stayed this way for the next two to three days too. I love using purifying clay masks, and this one is a keeper for sure. What’s more, it’s so easy on the pocket! The other new offering in the range is the Blue Agave Whipped Nourishing Detox Mask (also $9.99). Its texture is more gooey and sticky than the clay mask, feels lighter when applied on skin, and doesn’t come with a warming effect. But it does leave a cool, tingly sensation on your skin, like what fresh minty Colgate feels in your mouth after you brush it. This mask was also pretty effective in cleansing my skin from dirt and oil, but the effects weren’t as pronounced as the Instant Warming Clay Mask. Still, I like that my skin felt softer and smoother after using this. And because this mask has a lighter texture compared to the clay mask, I would use this more regularly and save the clay mask for times that my face would need a thorough cleanse, like after a sweaty workout or hike. What are some of your favourite masks in your skincare routine right now? 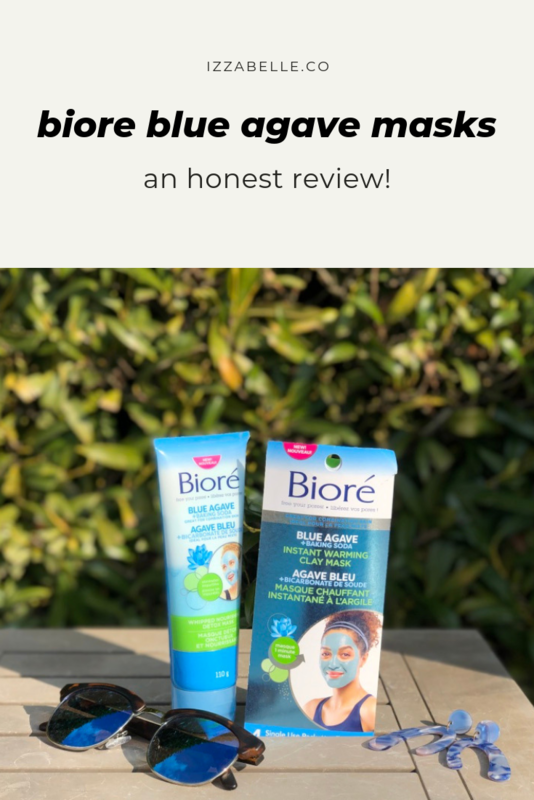 Would you give these Biore masks a try? :) I’m definitely bringing these back to Singapore when I return home to visit in a few weeks - it gets ultra hot out there since we’re located on the equator, and I hate having oily skin and clogged pores!